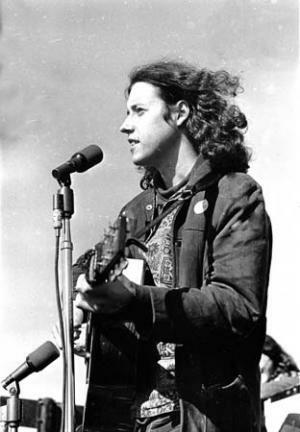 Arlo Guthrie was born on the 10th July 1947, in Coney Island, Brooklyn, New York City USA, and is a folk musician, particularly well known for singing protest songs against social injustice; his song “Massachusetts” is considered to be the state’s folk song. Guthrie has been nominated for the prestigious Grammy Award twice, during being active in the entertainment industry since 1967. How rich is the musician? It has been estimated by authoritative sources that the overall size of Arlo Guthrie’s net worth is as much as $10 million, as of late 2016. Music is the main source of Guthrie wealth. To begin with, he is a son of folk music legend Woody Guthrie (1912-1967) and the dancer Marjorie Mazia Guthrie (1917-1983); his sister is record producer Nora Guthrie. Arlo Guthrie graduated from Woodward School in Clinton Hill, Brooklyn and then attended Stockbridge School in Massachusetts. For a short time he studied at Rocky Mountain College in Billings, Montana. Arlo made his first appearance at aged 13, continuing the musical tradition of his father. His musical development was influenced by Leadbelly, Cisco Houston, Ramblin ‘Jack Elliott, Sonny Terry and the Weavers. Guthrie’s career began at the Newport Folk Festival in 1967, in which he performed the 18 minute song “Alice’s Restaurant Massacree”. At the age of 20, Guthrie had already toured overseas, and he performed at the now iconic Woodstock Festival in 1969, where he presented his version of “Amazing Grace” and Bob Dylan’s “Walking Down the Line”. Around the year 1972, Guthrie sang Steve Goodman’s “City of New Orleans”, which appeared in 4th position on Billboard Easy Listening and 18th on Billboard Hot 100 charts. Even 40 years later, the song with the line – Good Morning America – is regularly played overseas as well as in Europe. In 1991, Arlo Guthrie bought the Trinity Church, known as Alice’s Restaurant, and set up the intercultural and interreligious Guthrie Center. In 1992, he was nominated for a Grammy Award for the album “Woody’s 20 Grow Big Songs”, which he recorded with his sister Nora – who is the director of the Woody Guthrie Archive – and his brother Joady. Another Grammy nomination he received was for the Best Music Album for Children entitled “This Land Is Your Land” (1997). His net worth was rising steadily. Guthrie has mastered a variety of instruments, appeared as an actor, and written an award-winning children’s book entitled “Mooses Come Walking”. Even now the country singer is on tour almost every year. In Germany, Arlo Guthrie has toured several times with Hans-Eckardt Wenzel, with whom he also recorded a joint CD “Every 100 Years Live on the Wartburg”. It is worth saying that Arlo Guthrie preferably plays Western guitars from the company Gibson, which brought him the Arlo-Guthrie-LG-Signature guitar in his honour. Finally, in the personal life of the singer, Arlo Guthrie has four children, including daughter Sarah Lee and son Abe, with whom he has collaborated on tour with Gordon Titcomb. His wife Jackie, to whom he was married for 43 years, died from cancer on the 14th October 2012 at the age of 68. 1 [on Woodstock, 1969] What made it wonderful was the fact that all those people could get along together without one black eye, one cut lip. That's what went down - the kids respected the cops for doing their thing (and doing it well, too) and the cops respected the kids for not running wild - even though the conditions were terrible. You know, they could have started burnin' stuff down, but they just sat there and were grooving with each other. 2 [on the advent of 'Flower Power'] All political systems are on their way out. We're finally gonna get to the point where there's no more bigotry or greed or war. Peace is on the way. People are simply gonna learn that they can get more by being groovy than by being greedy. 3 My only description for me is that there's no throwaway people. That's the creed that I live by. It doesn't matter if I'm singing or not. That's the kind of person that my father and mother wanted me to be. The end obligation is to make people feel good about who they are. 4 I don't do anything on stage that allows me to become a trained seal, where you're just doing the same thing over and over. 5 You can't have a light without a dark to stick it in. 3 Served as one of several celebrity witnesses to testify at the trial of the Chicago Eight, featuring defendants Abbie Hoffman, David Dellinger, Jerry Rubin, Tom Hayden, Bobby Seale, Rennie Davis, John Froines, and Lee Weiner (1969-1970). 5 Had a hootenanny-style bar mitzvah when he was 13. His Hebrew tutor was the then-unknown Rabbi Meir Kahane, who later became founder of the Jewish Defense League. Labor Day 2013 performer: "I'm Going Home" / writer: "I'm Going Home"
Radio Unnameable 2012 Documentary performer: "Alice's Restaurant" / writer: "Alice's Restaurant"
Taking Woodstock 2009 performer: "Coming into Los Angeles" / writer: "Coming into Los Angeles"
From Wharf Rats to Lords of the Docks 2007 Documentary performer: "The Ballad of Harry Bridges"
Kurt Cobain About a Son 2006 Documentary performer: "The Motorcycle Song" / writer: "The Motorcycle Song"
Hollywood Rocks the Movies: The Early Years (1955-1970) 2000 TV Movie documentary performer: "The Alice's Restaurant Massacree" / writer: "The Alice's Restaurant Massacree"
The '60s 1999 TV Movie performer: "Comin' Into Los Angeles" / writer: "Comin' Into Los Angeles"
Lucky Luke 1991 performer: "The Lonesomest Cowboy in the West", "Lopin' Along"
Woodstock: The Lost Performances 1990 Video documentary performer: "Walking Down the Line"
Lady Liberty 1971 writer: "Gabriel's Mother's Hiway"
Clay Pigeon 1971 lyrics: "I Could Be Singing", "Gabriel's Mother's Highway Ballad # 16 Blues" / music: "I Could Be Singing", "Gabriel's Mother's Highway Ballad # 16 Blues"
Two-Lane Blacktop 1971 performer: "Stealin'" / writer: "Stealin'"
Once Upon a Wheel 1971 Documentary performer: "Wheel Of Fortune" / writer: "Wheel Of Fortune"
Woodstock 1970 Documentary performer: "Coming Into Los Angeles" / writer: "Coming Into Los Angeles"